Warning: this post is all over the place. Just kinda wanted to update you guys, share some things I'm loving, and ramble on and on just because well, this is my place to do just that, right? Right. Happy almost Friday! I'm sorry I've still been a little MIA lately...things are still going well over here - Grayson is proving to be one of the sweetest, relaxed babies out there and he is the perfect addition to our family! We love him so much. It's been a huge relief to us that he doesn't have the same breathing issue or reflux that Camden had when he was a baby. He is, however, looking more and more like his big bro every single day, he's just a little chunkier! So what else is going on? Well, Wednesday's and Thursday's seem to be the least chaotic days in my life right now because Camden is still going to his nanny's on these days, which gives me the one-on-one time with Grayson that I really crave and also gives me time to get things done! Yesterday I felt like a million bucks because I went shopping for 3 hours, paid bills, cleaned the house, took Rocky to get his haircut (I did forget about his appointment but when they called me I rushed him over, lol! ), cooked dinner, and managed to relax a bit. Say whatttt?! I'm not sure how many times this will happen, so yes, totally documenting it. On the days that I have both boys, my goal is simply to keep them both happy (ahem-minimal meltdowns I should say), alive, and make myself look semi-presentable by the time Billy gets home. And hey, we're doing pretty damn good I think! Getting out of the house at least once per day seems to be the key to keeping us all sane...especially Camden. Oh, and another key to my sanity has been to simply forget perfection. I tend to be really hard on myself and always want things to go smoothly, but the biggest lesson I've learned these past three weeks is to cut myself some slack and realize that our days WILL NOT be perfect right off the bat. Grayson might nap on the go a little more than I'd like (or even skip a nap)...Cam might watch one too many episodes of Mickey Mouse when I feed the baby...the dishes might pile up in the sink...and that's OK! This transition period won't last forever and we'll soon have our "groove" down. Moving on...I wanted to keep it simple and share some favorites/things going on lately! +Our SIX year anniversary is next weekend, but we're actually celebrating this Saturday because Billy's brother is getting married next weekend! We will share an anniversary weekend :) My parents are babysitting our boys so that we can go out to dinner. We're going to Eddie Merlots which is also where we had our rehearsal dinner so it's a favorite of ours! I'm pretty stoked about it. Now what do I get Billy? #HELP! the middle red shade is my favorite (called "Rock the Runway"), that dark blue shade ("Caviar Bar") will be perfect for fall! +Speaking of Billy's brothers wedding...it's going to be insane. I'll have a 19 month old (who is the ring bearer!) and a 1 month old to take care of in a different city so I'm a little nervous how it'll all play out, but luckily my parents will be there to help me out since Billy is in the wedding. Thank heavens for grandparents! Also, since I will be just one month postpartum I decided to try rent the runway for the first time (since they will send you two different sizes) so I'm crossing my fingers the dresses I ordered will work. +Bachelor in Paradise. So bad you just can't look away! +The fact that I can drink wine and Corona Light again. Amen. +Moments like this. 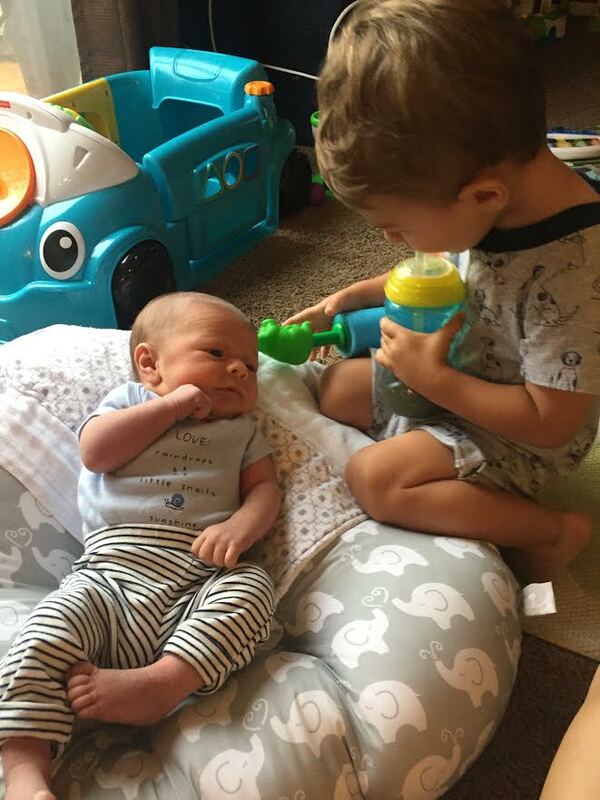 Camden is constantly showing Grayson his toys and trying to share them with him. Melt my freaking heart, I'm so excited to watch them grow up together! Alright, that's enough from me today. I have a bunch of posts I'm currently working on (including a few giveaways) so be on the lookout! Also, would anyone be interested in a "day in the life of" post with the kids schedules and such? I know I like reading them from other bloggers, so maybe I'll do one? It sounds like your doing great at this two kid gig. I cannot wait to hear more about a Katie and Steph Reunion!!! 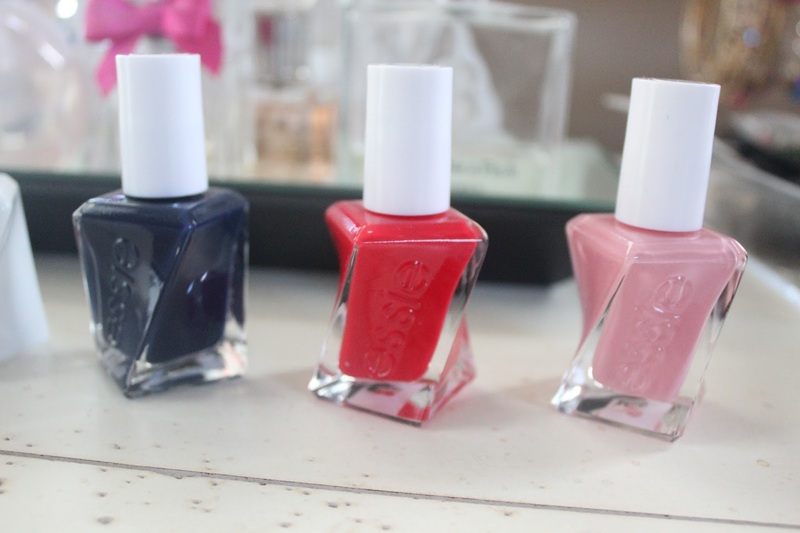 I have been looking for some new gel colors and just might have to try out this Essie. Thanks for sharing!!! Glad to hear things are going well! Enjoy that newborn stage it is just the best! I would love to hear how you are managing pumping with a little toddler running around! Yes on the day in a life post! Would love to compare our days! Thanks for the tips via Facebook yesterday btw. So nice that we can chat about this stuff since we are at the same stage with our boys!! Hat is so great you get 2 days with just Grayson! I'm seriously considering taking Camden to his old daycare once a week for the same type of 'break' in the middle of the week. Sounds like you are doing a great job with two kiddos! Happy Anniversary and have all the fun at the wedding! YES day in the life! I am pregnant with baby #2 now and already freaking out about the 18 month age difference. Obviously excited, but freaking out nonetheless! Loveeee that gel polish! All the praise hands for grandparents to help out! I’ve had a couple of events at this location. The only thing that would have made these guys from NYC wedding venues better would have been better communication in the earlier planning stages, but it all worked out great in the end.